On July 12, 2017, the Intergovernmental Forum on Mining, Minerals, Metals and Sustainable Development (IGF) organized the national launch of the evaluation report on the Senegalese Mining Policy Framework (MPF) in Dakar, followed by a training workshop on socio-economic benefit optimization from July 12 to 14. 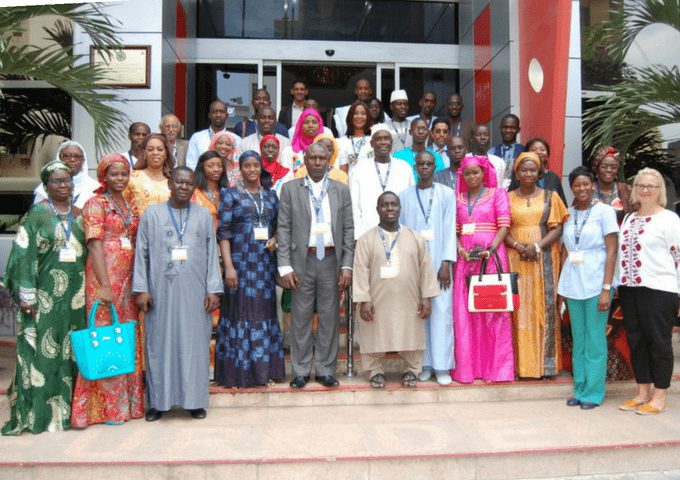 The workshop was part of the second phase of the evaluation of the Senegalese MPF. The aim of the training session was to strengthen the abilities of Senegalese public and private parties working in the mining sector, who, on a daily basis, work on assignments relating to economic and social issues arising from mining. In addition, a national multi-stakeholder discussion on Mauritania’s MPF report and subsequent workshop provided an opportunity for national consultation between various national stakeholders on improving the sharing of mining rents between the central government and local authorities. Senegal’s MPF report was the subject of a national launch chaired by the Chief of Staff, Mr. Mondienne Guisse, for the Ministry of Industry and Mines. Mr. Guisse reaffirmed Senegal’s commitment to improving governance in its mining sector and welcomed the constructive collaboration between the IGF and Senegal. This was followed by a panel moderated by the IGF and composed of Mr Guisse; the President of the Senegalese Chamber of Mines, Mr. Aziz Sy; Mr. Oumar Diallo, representing the civil society organizations; and Mr. Richard Faye, sub-prefect of a mining region in Manwane. Panellists were invited to share their thoughts on the findings of the impact report within the context of their activities, including actions taken to remedy the shortcomings identified in the report. Participants, all from a variety of backgrounds, welcomed the methodology used and concurred with most of the report’s conclusions, having already implemented some of the recommendations. Senegal adopted a new mining code in November 2016 and, despite provisions contained in this new code having been taken into account in the assessment of Senegal, participants at the forum noted the need to update the assessment results in light of the implementation of the new legislation. The launch of the report attracted close to 50 people and generated a great deal of interest among Senegalese media, including a strong presence by print, radio and television. 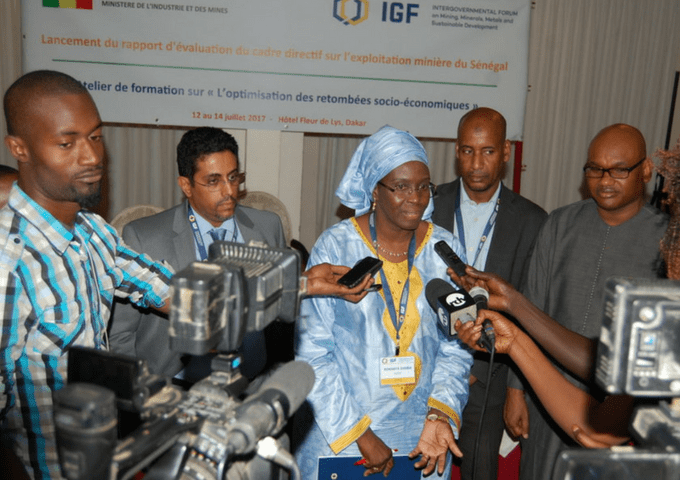 Clémence Naré of the IGF, Ms. Rokhaya Samba Dienne from the Minister of Energy and Mines of Senegal, and Mr. Cheikh Zamel, the head of the Mauritanian delegation, responded to questions from journalists, as well as President of the Senegalese Chamber of Mines Mr. Aziz Sy. Download the full meeting report in English or French, or see a summary below. Strengthen the ability of government officials and other stakeholders to understand and develop strategies and policies used to maximize and communicate the socio-economic benefits of the mining industry to local, regional and national stakeholders. Promote and encourage dialogue between the various Senegalese stakeholders involved in managing the mining sector. Create a framework for exchanging and sharing experiences with their Mauritanian counterparts who have also been the subject of an MPF assessment. The training session focused on the knowledge and tools needed by the various parties to address the main weaknesses in order to improve social management in Senegal’s mining sector. The consultant spoke to participants about the reasons motivating companies to provide socioeconomic benefits in mining project areas, the importance of consultation and engagement with communities, the concept of corporate social investment, funding of community development by businesses, local content in terms of employment and business opportunities as well as workplace health and safety. At the end of the training session, an IGF representative invited participants to continue the model of meeting and consultation they had begun, and to maintain a regular dialogue between different actors on the themes of the MPF.